This post originally appeared on Minxeats.com on May 13, 2013. My favorite flavor palettes come from China and Thailand and I find myself using them pretty frequently in my weekend dinner-making. Despite the vibrancy of seasonings like Sriracha, star anise, and Thai basil, eating similar flavors over and over can get, well, boring. So one recent weekend, I mixed things up a bit and prepared a meal with origins in the Mediterranean. And I don't mean Italy or Greece - Turkey's there too, along with Egypt and Syria, Albania, and Bosnia. Lamb is a popular protein in that part of the world, and it is often flavored with what we might otherwise consider "sweet" spices. You know, the seasonings most familiar to us in pumpkin pie - cinnamon, nutmeg, and cloves. Combined with cumin and paprika, these sweet spices both camouflage and accentuate the characteristic "gamy" flavor of lamb. 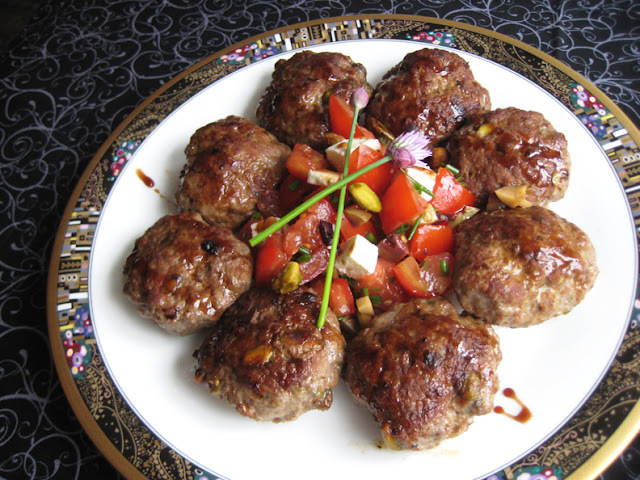 These rather sausage-like lamb patties, borrowed heavily from a kebab recipe found in chef Silvena Rowe's Purple Citrus and Sweet Perfume: Cuisine of the Eastern Mediterranean, would be perfect skewered and cooked on the grill, but they were also quite tasty when pan-fried and served with a sprightly salad of tomato, feta, and olives. Mix all ingredients except molasses thoroughly. Form into eight small patties. Refrigerate on a covered plate for at least one hour and up to overnight to allow flavors to meld. Cook patties in a bit of olive oil in a hot pan until browned on both sides and cooked through, about 10 minutes. Serve with tomato salad and a drizzle of the pomegranate molasses. Combine first seven ingredients in a bowl. Allow to rest at room temperature for at least half an hour so flavors can meld. Add cheese when ready to serve.